The town of Schotten is said to be the place of origin of both the Schott family and the Schott name sometime between the 11th and 13th centuries. 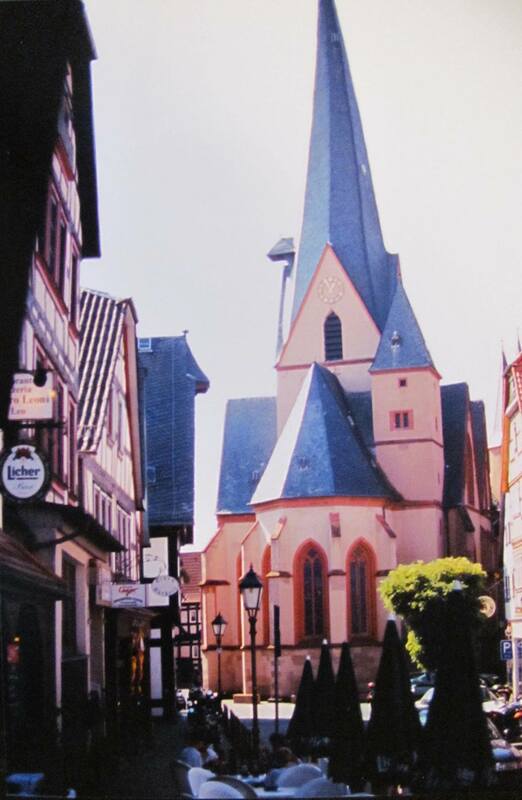 The official history for the town of Schotten, Germany, is that an early document mentions a church “ad scotis” or “of the Scots” that is one of eight churches that Abbot Beatus bequeaths to the monastery Honau by Strasbourg. It is thought that this is likely to have been the first church in Schotten, which was built by Irish-Scottish monks. This church probably grew, and by 1050, the first Roman Catholic church was built. Then, in the 1300s, the original Liebfrauenkirche (which was still in existence in 2001) was built in the town of Schotten. While the idea of Scottish (which may have actually been Irish) princesses wandering around 11th century Germany may seem improbable, there is evidence to support this. During a renovation of the church in Schotten in the 1700s, a parchment document dating from the 1300s was discovered which stated (in Latin): “anno 1015 after the birth of Christ in the reign of the King nicknamed the lame (Henry II, Emperor 1002 – 1024) two sisters from Scotia, one called Rosamunda, the other Dicmudis, began to build this town and our first church at Schotten.” There were also two wooden busts of these two sisters found in the church. 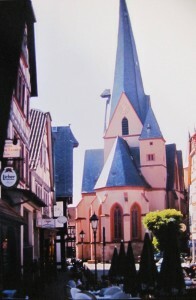 There were several “Schottenkirchen” (churches started by Scottish-Irish monks) in the Hessen area, all dependent on the mother church at Strasbourg. Florens, an Irish hermit, had been elected bishop of Strasbourg in 679. It’s likely that these two sisters were Irish, rather than Scottish, since Irish monks had been instrumental in spreading Christianity to the European continent, beginning with the work of St. Columban in 585. 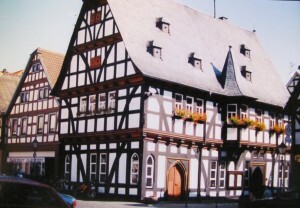 According to Die Schottenchronik, the Schott family left Schotten in the late 12th or early 13th century and settled in other parts of Hessen. Today Schotten is a modern town and well-known vacation spot for sports enthusiasts. Very interesting – thanks for posting! Small world! My Volga Germans were from Schotten area. I was there in 2013. Interesting story. What an interesting article! 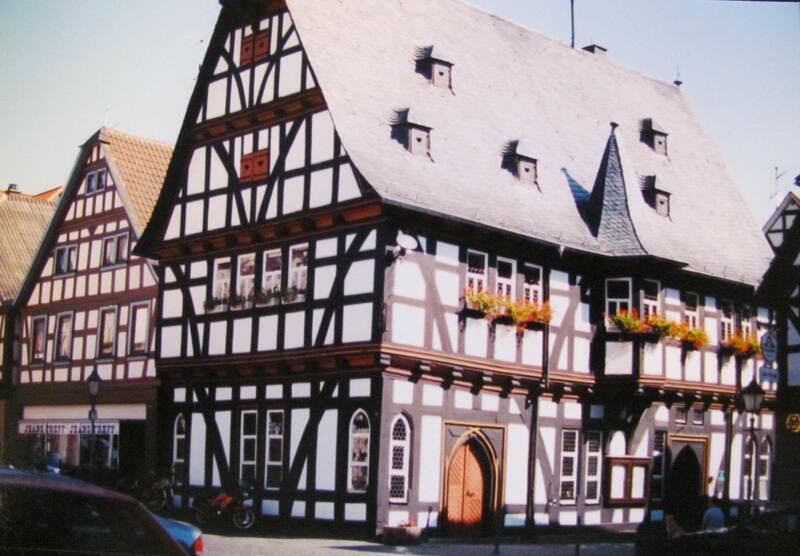 My ancestors came from Ober-Seemen, Hessen (less than 12 miles from Schotten). I recently did DNA testing and was surprised to find that my haplogroup, R-Z253, is strongly associated with Ireland. Additionally, I have many Irish & Scottish genetic matches. I find it too strong a coincidence that my paternal ancestors came from a village less than 12 miles from Schotten and I carry an Irish y-haplogroup! My mother’s maternal grandmother was born in Schotten. She came to New York City in 1885. We thought we had German mtDNA. My brother took an extremely detailed DNA test and it turns out our mtDNA is from the Hebrides Islands of Scotland. This means my Celtic ancestress traveled with the Ionian monks when they came to Scotten to found a monastery in the late 700’s. It also means that my maternal line did not leave Schotten from the late 700’s until 1885. Her name was Carolina Zimmermann. I once saw a picture of the mayor of Schotten online. His surname was Zimmermann and amazingly enough he looked very much like my brother. @Gwenda – that is VERY cool! You’ll also want to make sure the paper trail of genealogical records backs that up, but what an interesting clue!